My blog is worth $314,448.78. I'm thinking about writing the description for the WeAreMedia Module 6: Considering the ROI for this week. Okay, I'm procrastinating. I was inspired by Connie Bensen, a community strategist, who shared a post celebrating the success of her blog over the past year. About a year ago, I decided to benchmark my blog using some tips suggested by Avinash Kaushik. A year ago, he said that measuring outcomes for social media is, "an evolving art (not quite a science yet) and you have to be up to the challenge of both thinking a bit differently and be ok with leveraging several different tools." I think this statement still holds true, although with more people thinking about ROI and Social Media, practice is evolving. Measuring the success of social media efforts can't be done with a single metric. I think there will be different metrics for different strategies, organizations, and tools. So, here's a comparison between last year and this year and another opportunity to consider improvements. I don't think this metric has any meaning in isolation. Does an abundant production of posts with more words per post make for a better blog? It is not useful to know how many posts you write on a monthly, weekly or daily basis or the number of the words for comparisons either. For example, in April 2007 I wrote 52 posts, but in April 2008 I wrote 61. What does that mean? This metric is only meaningful (to me) when considered against a goal. My goal was consistency which for me means to blog daily or 30 posts per month. This is not foolish consistency. My reason for daily blogging was it would improve the quality of my thinking and writing. I believe it has also helped with increased reader numbers and possibly reader retention. Avinash Kaushik agrees. So, calculating this number help me see if I've kept this promise with myself. Many people ask me "How often should I post?" As if there was a magic number that would guarantee success. So, if you are just starting up, pick a frequency that you can sustain over time. If you're blogging, who is listening? And how has the audience grown overtime? This can be measured by unique readers or "How many people read your blog?" That's a hard question for me to answer because as Kaushik notes and all of us bloggers know all too well -- many analytics programs do not track RSS feeds. And, while we you can track the subscriber numbers, you don't necessarily know who is actually reading. RSS reading patterns are changing. Kaushik makes a distinction between "on-site" visitors or unique visits as calculated by your analytics program and "off-site" visitors. Now, when I go back and look at my "on-site" visitors or monthly unique visitor or visits in my analytics program, Google Analytics, that number is steadily growing. In early 2008 it was slightly lower for several reasons. My blog turns up in the first three Google results when you Google the word "Beth." A year ago, I decided to tweak my blog title from "Beth's Blog" to "Beth's Blog: How Nonprofits Are Using Social Media" because I had a lot of referrals from Google for the word "Beth." So, I changed the title and the unique visitors when down slightly. And I think that's a good thing .. Why? The unique visitor count doesn't include the people who aren't looking for information about social media and nonprofits! I want people who find me via a google search to want to stick around and join the conversation, not click away. While the immediate impact was to drop in monthly unique visitors, it has now started to grow. I know I need to do more with SEO, particularly with blog post titles and the like. Maybe I need an SEO makeover and advice from Bill Snyder and Jonathan Coleman. Or study bloggers SEO resources in more depth. I think the more important metric here is RSS subscriber trends or what Kaushik called "off-site audience." People who subscribe via RSS or email are making a commitment a level of above those clicking over from a google search or referral. My readership those who subscribe has continued to grow over time In June 2007, I had 1,260 subscribers. In June 2008, it has more than doubled. 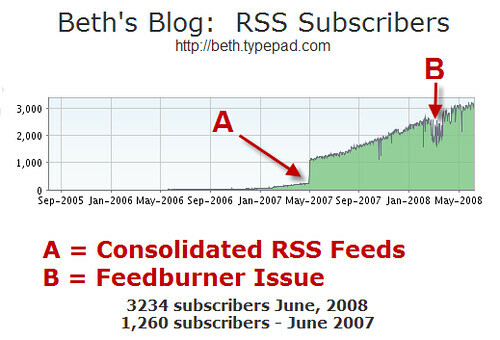 The dramatic rise a year ago was I consolidated several RSS feeds so Feedburner was reporting aggregate statistics. (Thanks to Chris Blow, a reader, who helped me figure it out). The dramatic dip had to do with feedburner issues. With all that aside, I'm pleased with these stats! Thank you readers! During the last year, I added the option to subscribe via email -- and only a small percentage of subscribers (less than 200) are email subscribers. What is interesting to me is that when I get a notification when people unsubscribe and I typically email and ask why. Some unsubscribe because they feel my blog is too technical and they are looking for pure marketing or fundraising or nonprofit news - and I refer them to other blogs. Some tell me they are simply overwhelmed with email. I try to encourage those email subscribers to consider switching to RSS and point them to some resources. This also reinforces for me the need to streamline and simplify my messy categories and add a page or link for newcomers to the blog. I continue to explore how to improve my writing/blogging and I continue to put into practice these tips for increasing readership. Conversation habits in the comments in the blogs - it's what makes them a social media.. And, the good news is you can measure it! I had to compute mine manually by counting them in typepad. A time consuming pain. Why doesn't typepad have this integrated into its platform? Anyway, since I didn't want to spend all day on this and since I couldn't really slice and dice the data easily, so I only compared two months - May, 2007 and May, 2008. (I did not include spam comments or my own). Last year, I had a ratio of 1.4 and simply want to improve the quality of the conversation taking place in the comments. I've been thinking about and blogging about - take for example conversation readiness and conversation strategy posts I wrote recently. I've also read and re-read every single word Amy Gahran has written on the topic. When I first started blogging, I hardly received any comments at all. So,if you're just starting out and worried about the lack of comments - this is normal. It takes time. But here are some tips to help encourage comments. One reflection exercise is to look at your posts and notice which ones attract more comments than others. Those that are simply announcement or share a pointer to an event or resources do not get comments. I had less of those in May, 2008 compared to May 2007. Posts that summarize viewpoints from many different sources, posts that ask questions at the end or in the title, and posts that tell stories seem to attract more comments. When I asked people to comment - particularly when incentives like book giveaways are offered that also ups the commenting. So, should I consider this a success? Well, that award goes to you dear readers who are willing to contribute your thoughts and provide insights. Aide RSS wrote about measuring social engagement on a blog which that looks at a number of different metrics. You can do an analysis of your blog feed here. Here's a recent analysis of the "best" posts on my blog and I need to go figure out what the numbers mean. If you just stick to your blogging and write great content then there is no better authority, at the moment, that will provide you a metric to compare your impact on the blogging universe. It is a simple metric, there are 70 million blogs and if they were ranked from one to seventy million then what would your rank be. Again, I have not consistently written down and charted my technorati rating, but I do know that trend has been to more or less go up. My technorati rank increases when I'm in the heat of a fundraising campaign and reaching out to people to spread the word. Last year, my number of outbound links was at 484. It currently 575. That goal setting exercise seems right for businesses, but nonprofits? 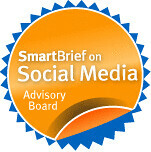 I try to link to and encourage as many nonprofit bloggers as possible and help them increase their technorati rating. Why would I want to make it into a football match? Setting the goal is step 1, but of course a strategy is needed. What is most important for me is to track and reflect on what makes that technorati rating rise. It has to do with reciprocity. What is the cost to your life, business, time of your blog? Compute it and you’ll be surprised. I was surprised to read that he invests 25 hours a week on his direct blogging process (answering email, writing, researching, maintenance.) I haven't tracked my time on "direct blogging process" and it is also hard to separate from other work because the two are so intertwined. Take for example, I writing this post because I'm trying to think through some ideas for ROI and Metrics for a project I'm working on. And, I blog on multiple sites, but I cross post here. Oh, this is sort of hard to precisely measure. Interestingly this is a addiction and I don’t think that the investment is going to go down. But at least I know, and so should you. I'm not sure I'd go as far as saying I'm addicted ... okay, okay, yes I am. However, I have found the daily discipline of writing extremely important to my professional learning. So important that I get crabby when I don't blog. The key for me is that the topic I'm blogging about is close to my work and my passion. I probably spend at least 10-15 hours per week on direct blogging work for this blog. And given the tracking tasks outlined, that will probably go up. Kaushik does not provide an ROI, but mentions the "happiness" factor related to blogging. Last year, I used a widget that calculates your blog's worth using your technorati ranking. Last year, my blog was worth $271,000. This year $314,000.I have to admit that number is hilarious! If I made that much money, I'd stop working and I'd contribute more of my time to worthy causes. The ROI is hard to compute because there are so many intangibles. Like the fact that blogging forces me to do a certain level of reflection everyday and that makes me think more deeply about my topics. And, then readers comment and help me get smarter which in turn deepens my expertise. But, over time, the blog has changed from just a professional development tool to a marketing and business development tool. It's been a busy spring! You've really been a huge help. Thank you for taking the time to help us newbies along. I especially appreciate both the quality and the personal nature of your posts and learning tools." The numbers and data alone are almost meaningless unless you take those numbers think about how to make improvements, set goals, and reflect. The reflection involves qualitative data -- anecdotes, reflections, stories, and pattern analysis. I have some clear ideas of what I need to do to make improvements - so this exercise has been worth it. I most likely need to integrate more regular reflection into my routine. So, dear readers, have you set goals for your blog (or web site?) What metrics or qualitative or quantitative data do you use to measure them? How do you reflect on them? This is a very helpful post (asusual), and is helping me think through my own blogging ROI as I have reached the 6-month mark at SocialButterfly. Wow Beth! You've done a great job with metrics here. Totally impressive.